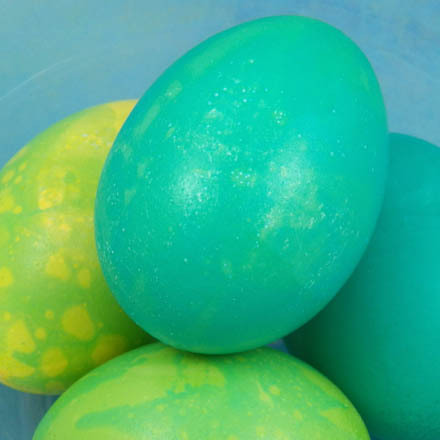 Follow these instructions for how to make a basic dye bath to color your Easter eggs. 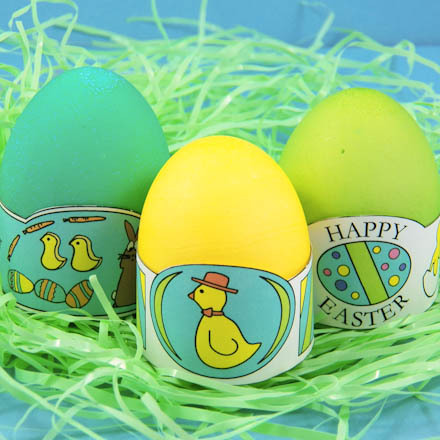 Related crafts: Make decorative holders to display your Easter eggs using printable patterns in the Easter Egg Holder project. Follow the instructions in the Marbled Eggs project to add swirls of color to your eggs. This project is rated VERY EASY to do. Hot water requires adult supervision! In each mug or small bowl, combine one tablespoon of vinegar, 1 cup of boiling water, and 15 to 20 drops of your choice of food coloring. Use less food coloring for pastel colors, and more for darker colors. Tip: Be sure that the mug or bowl is deep enough so that it does not overflow when the egg is added. Test this with tap water and an egg before mixing the dye bath. For raw eggs, make a hole at the bottom of the egg the size of a dime, using a pushpin. Make a pinhole at the other end. Blow or shake to remove the yolk and egg white. Rinse the egg and allow it to dry. 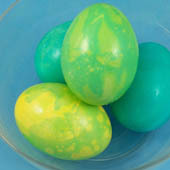 Use a spoon or tongs to slowly lower an egg into the dye bath. Be careful—the water is hot! Leave the egg in the dye bath for 3 to 8 minutes, depending upon how dark you want the color. During this time, rotate the egg and spoon colored water over it. 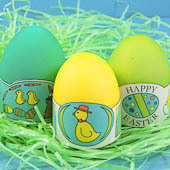 Tip: Dye eggs in a range of spring colors and display them in	Egg Holders. 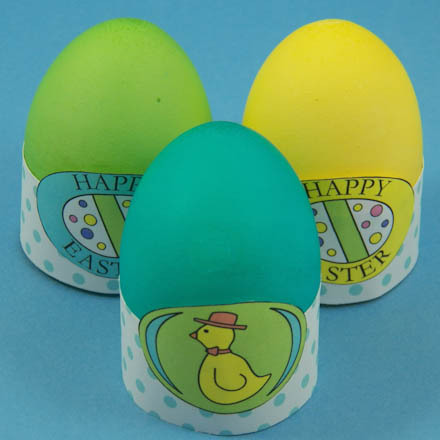 Tip: Make a display of your eggs with Easter grass and Egg Holders. Tip: Add swirls of color to your dyed eggs. Follow the instructions in the Marbled Eggs project.